The SportDOG Containment Fence is a solidly built, reliable system that is geared towards large rural properties and medium to large dogs. The collar is fantastically waterproof and won't be ruined by dogs who swim with it on. The collar is also pretty big and bulky. 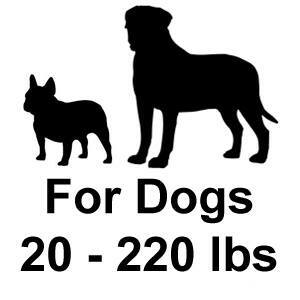 It simply won't fit dogs with necks smaller than 13" and the correction settings are too strong for dogs under about 20 lbs. Fortunately, the PetSafe In-Ground collars are also compatible with this fence system so you can find a collar suitable for any dog from 5 lbs up. Correction level settings are unique for each dog on the system and are set right on the collar. Exceptional Waterproofing: The SportDOG collar is really well waterproofed. This is a rough and tumble collar designed for big sporting dogs and it can take plenty of abuse including being submerged. There are no external buttons or controls that could let moisture in and even the battery compartment requires a screwdriver to get into. This collar has no trouble going for a swim so it's great for waterfowlers and properties with streams, lakes, ponds, and the like. 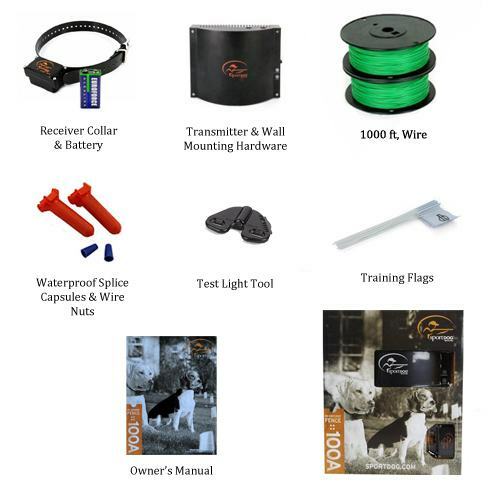 Includes Long & Short Contact Points: The SportDOG Containment Fence is one of the only dog fence systems that includes both long and short contact points in the fence kit. Most kits include only the standard length contact points and force you to buy the longer separately for dogs with long or thick coats. 5 Progressive Individual Correction Settings:The SportDOG collar has 5 progressive correction level setting plus tone and vibration. Each collar on the system can have it's own unique correction settings and there is no limit to the number of collars that can be simultaneously in use with this fence. Standard 9-Volt Battery:We always prefer rechargeable battery collars both for the convenience, the long-term money savings, and the environmental friendliness. If a collar does not have a rechargeable battery, the next best thing is a generic user-replaceable battery. The SportDOG Containment Fence collar uses a run-of-the-mill 9-volt that you can buy at your local convenience store or grocery store. Largest Capacity: The SportDOG Containment Fence is really the only fence system on the market that can handle up to 100 acres. Adjustable Frequency: The transmitter can be set to operate in either 7K or 10K frequency. This is particularly useful when a neighbor also has an in-ground fence system. When two in-ground fence systems operating on the same frequency are too near each other they may interrupt or even cancel each other's signals. Grounding Terminal: Because the SportDOG system is geared towards large properties, the transmitter includes a terminal for a grounding wire. Those in a lightening prone area with a large installation often prefer to install a grounding rod to protect their system from lightening strike surges that can fry the transmitter. Compatible With PetSafe In-Ground Collars: The SportDOG Containment Fence Transmitter is completely compatible with 4 PetSafe in-ground fence collars. This cross-compatibility is really essential for pet owners with smaller or more sensitive dogs since the SportDOG collar is big and bulky and not suitable for dogs under about 20 lbs. Lacks Battery Backup: Battery backup is a feature we would like to see on the SportDOG system. Given that the system is aimed at large properties where dogs may be quite far from the house, battery backup in the case of power failure would seem warranted. Collar Strap Fits Necks: 11"- 25"
The SportDOG containment fence is unreal. This dog fence system has changed my life. Walking the dog takes up a lot of time daily. I now feel rest assured my dogs are getting the exercise that they need. They are able to run around my 3 acre property and exercise often. I am very happy with the price that I paid. I searched and compared pricing with multiple companies. FlexPetz has the best offer for this dog fence system. I have the peace of mind knowing that my dog is secure and safe. The friendly staff was knowledgeable and very helpful. Thank you FlexPetz for this great dog fence system. Before I go into my frustration, I would just like to mention the positives of this fence. The transmitter its self was easy to set up and the overall installation was not difficult at all by any means. The collar fit my hound well and worked wonderfully during training and keeping her within the boundary. I have no complaints about the system at all, but the wire.... I am disappointing that such a great system had such crappy wire with it. I wish I would have looked more into the professional wire that is on this site before hand. The frustration is from the system working great for a week, but ended up not working after a small thunder storm. My yard was soaked and the wire ended up breaking from dibre. I went out and fixed the wire in two spots. It worked again just fine until the possum got a hold of it. When I found where that happened I had to replace the wire in that section. It was about three weeks in that I ended up pulling the wire up out of the ground and tossing it. I spoke with the techs at this place and I decided to get the best wire they had. I re installed the wire and buried it again and have yet to have an issue, a month and a half later. I would recommend this system but I would go with an upgraded wire. Don't buy this cheap crap that originally comes in the box. Skip the trouble and take my advise. Once again, great system, just crap wire! The SportDOG fence is awesome. I am pleased to write I am 100% satisfied with this dog fence that I purchased from FlexPetz. I have looked at many dog fences before I purchased this one. The friendly techs at FlexPetz did a great job of helping me make a decision of which kind of dog fence would fit my needs. The installation was quick and easy due to the helpful videos and diagrams on the FlexPetz website. After the installation the training was also simple due to the resources on the FlexPetz website. This system has been absolutely fantastic. Life is much better with a dog fence. The SportDOG fence made life much easier. Thank you FlexPetz. I have a very large property and two dogs that are extremely rough and like to play hard. I was very glad to know the I could get an electric fence that covers 100 acres and is made for rough dogs. We also have a lake on our property so the fact that the collars are waterproof make it that much better. I am proud to own it and would not even think about buying another fence from any other dealer, flexpetz, You are one of a kind. “The first fence that I had would not contain my huge dog. He would just ignore any boundaries and act as though the shock collar did nothing. I eventually got fed up with all the break outs and mishaps. That I went on the hunt to find a fence and collar system that would actually do what it says. while hunting I saw the FlexPets.com site I checked it out for a bit and came arcoss the sportDog. This system is unbelievably great in all ways and is made for lager properties. It also cover 100 acres meaning I can let him out and be worry free! I love the collar, it’s just enough to keep him inbounds but not hurt or disable him. And it came at a good price too!."